Our last post was on a method to remove camera sound using cCam mobile software. cCalc is another useful software from the same author. 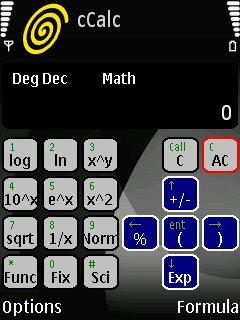 CCalc Mobile scientific calculator is a freeware application, but it can be used to perform complex numeric calculations that are impossible with your default symbian mobile calculator. Download cCalc Mobile scientific calculator from below to explore its features. Perform basic mathematical operations like addition, subtraction, multiplication and division. Application can solve user created formulas and equations. cCalc supports trigonometric functions and operators. The only free mobile calculator application for Symbian that support operations like Logarithmic, Power, Exponential, Reciprocal and square root. Supports the pi constant used in geometry. logical calculations and Boolean operation. Download cCalc mobile scientific calculator for Nokia here. There is a pro version of cCalc for Nokia Eseries mobile phones and it requires you to pay some amount as donation. A very good useful calculator. Use it. When all remarks that its the best calculator means its the best useful scientific calculator. I want for downloading mobile scientific calculator. Online calculators are more convenient than carrying around a big electronic calculator.